I am Harada but I am usually called by the nickname Aru. I am a guide for Okinawa so I am opening a nature and sports shop called “Aru Guide Okinawa”. Let's play in nature around the sea! Let’s sweat! Let’s take risk and adventure! 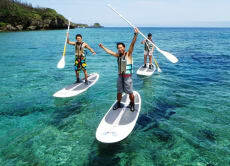 Relax and enjoy with my kayak, snorkel, and stand up paddle tour.